I have been working on Castiel slowly. I was able to repair the paint that I gouged around his eye sockets when I inserted his eyes. It’s not perfect but I’m reasonably happy with it. Then I started adding some shadowing and contouring. 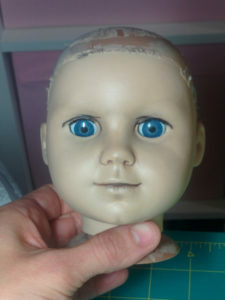 I’m finding it tricky … I tend to favour more realistic looking dolls but I had to keep reminding myself that there is only so much I can do to make a doll that is supposed to represent a pre-teen girl into a fourty-something man. Misha Collins (the actor who plays Castiel) has some very distinctive facial feature…namely his eyelids, his upper lip and the dimple in his chin. I tried to mimic these traits using shadowing. I also lightly shadowed where his eyebrows will go. For the eyelids, I elected to draw some dark lines in. I think it will look good once his eyebrows are on…I hope! I did smooth them out after this picture was taken. 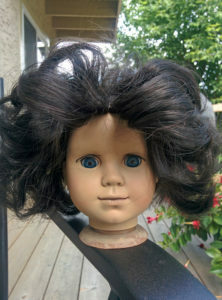 A while ago a doll friend of mine gave me an old AG wig that was in pretty rough shape. 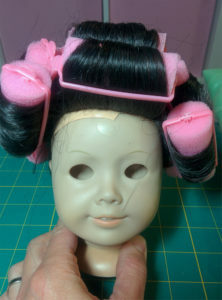 It was an old Josefina wig that had been chopped. Even though it had been cut, the ends were fried. This is after a hot water dunk. But when I was trying to figure out what I was going to do for a wig for Cas, I remembered that I had it and thought it might work. 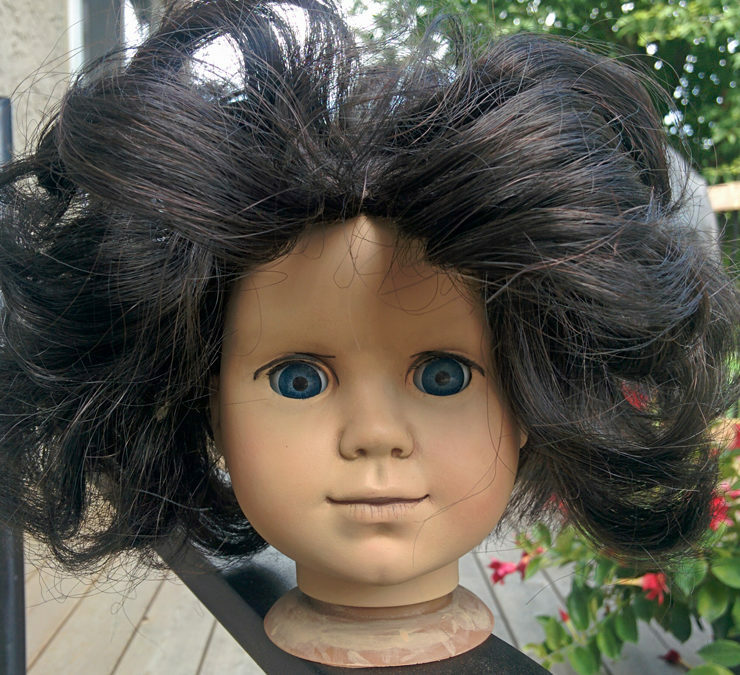 Cas has slightly wavy hair…bed head hair if you will. 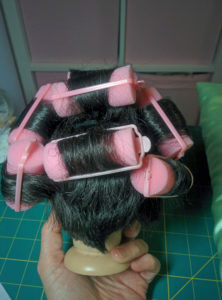 I got some foam rollers from the dollar store and set to curling. 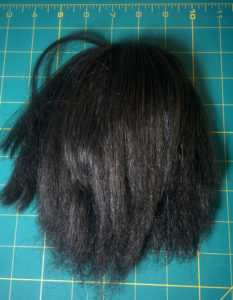 After rolling the wig, I dunked it in hot water and then left it to dry. I figured it would be easier to curl the hair while it was longer and cut it after. My son was extremely frightened by the result and I don’t think I blame him! I’ll try to remember to keep taking photos and posting as I make progress. You did a great job. I would enjoy watching you work. Thank you for sharing.